The Academy Brand has been growing quickly over recent years but found their online experience wasn’t keeping pace with what they wanted to deliver. feeling held bak by their technology, they engaged Arkade to take a fresh look at their customers, experiences and technology. As part of our platform discovery, we found it evident that The Academy Brand’s legacy Magento site was not growing with the brand. They needed their online business to service their customers with more agility. The business users also needed to see less investment of time and money in ‘business as usual’ and technical maintenance tasks that added little value to the customer experience. Overall, there was a need from both customers and internal users to find a platform that was more suited to their need for better customer experiences and usability of online channels. Our first initiative to begin creating a more aligned and seamless customer experience online was to deliver a modern, responsive ecommerce site that was in line with the brand’s aesthetic. This allowed the product to shine and most importantly allowed customers to shop and the brand to sell. Speed to market and a cost effective implementation was key as was the ability to remain agile and nimble in market ongoing. The Shopify Plus website delivered by Arkade allowed Academy Brand to merchandise their site in a more tactical way. Our custom integration to their Apparel 21 ERP system removed many previously manual tasks and leverages some of the more advanced features of both platforms. 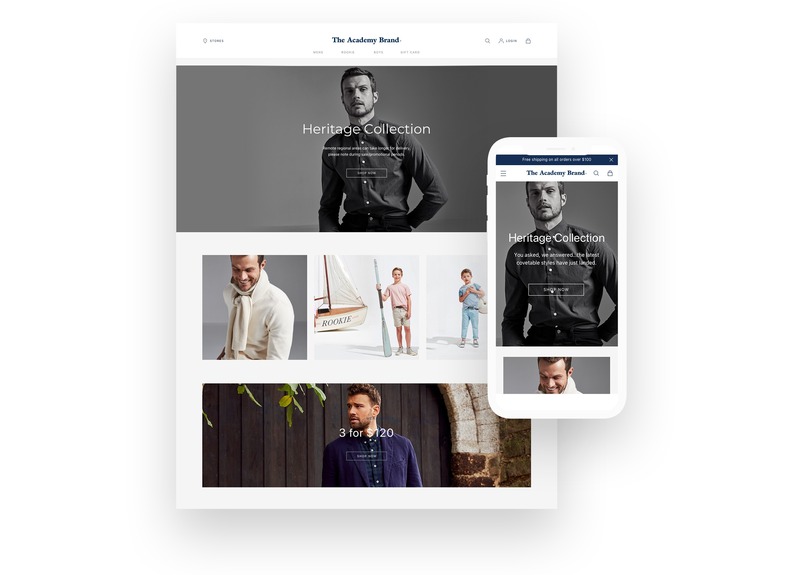 Algolia was used to create smart, searchable product indexes and category pages – as a result product discovery across the entire mens and boyswear range was significantly improved. Now there is a robust foundation in place for ecommerce, more and more interactive improvements and interactions with customers can be added to their CX suite to continue to provide better experiences for their customers.